Corbynite group Momentum has said it will seek inspiration from the “success” of Beto O’Rourke, a Democratic Senate candidate who narrowly lost to Texas incumbent Ted Cruz in the US mid-term elections on Tuesday. O’Rourke, a rising star in the Democrats, came within three points of securing the typically deep red state, winning 4,003,513 votes to his Republican opponent’s 4,224,065. Commenting on the results, Beto O’Rourke said he was “as inspired and as hopeful as ever”, and there is speculation that with bolstered name recognition he will seek the 2020 Democratic presidential nomination. Conceding to Cruz, the charismatic punk-turned-politician also said to a crowd of supporters: “I f—ing love you guys!”. 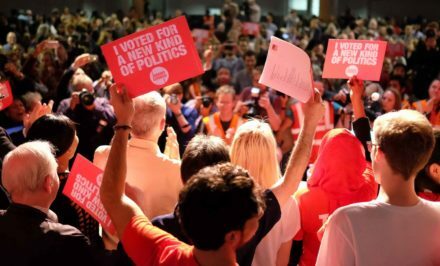 Although a few journalists have already mocked Momentum’s announcement, O’Rourke has become a popular figure amongst Labour Party activists across factional lines. His campaigning efforts have gained widespread admiration, particularly his mass fundraising without PACs and a digital strategy that mobilised tens of thousands of volunteers. According to Momentum, O’Rourke campaign activists knocked on over 2.8 million doors and made more than 20 million calls to voters, all helping to make significant gains in registering new voters. The Corbynite group has pointed to the online get-out-the-vote (GOTV) campaign map, win.betofortexas.com, as a particular highlight. O’Rourke also received endorsements from celebrities include Beyoncé. Democratic Socialists of America members Julia Salazar and Lee Carter, plus former Bernie Sanders adviser Becky Bond, all recently attended The World Transformed festival, which grew out of Momentum. The organisation says it will invite senior organisers of the O’Rourke campaign to the UK, so strategies and tactics can be shared. Laura Parker, Momentum’s national coordinator, said: “The incredible power of Beto O’Rourke’s campaign in Texas shows the effectiveness of combining people-power, innovative campaigning techniques and a bold platform of left-wing policies. While many of these techniques were pioneered by the Bernie Sanders campaign and used by Momentum, the sheer scale and sophistication of the Beto campaign is a real leap forward. The election results more widely saw the Republicans hold the Senate, where they are expected to increase their majority, but the Democrats have taken control of the House. This will help Democrats hold President Trump to account via committees and block his legislative agenda. The mid-terms this year were marked by especially high turnout.